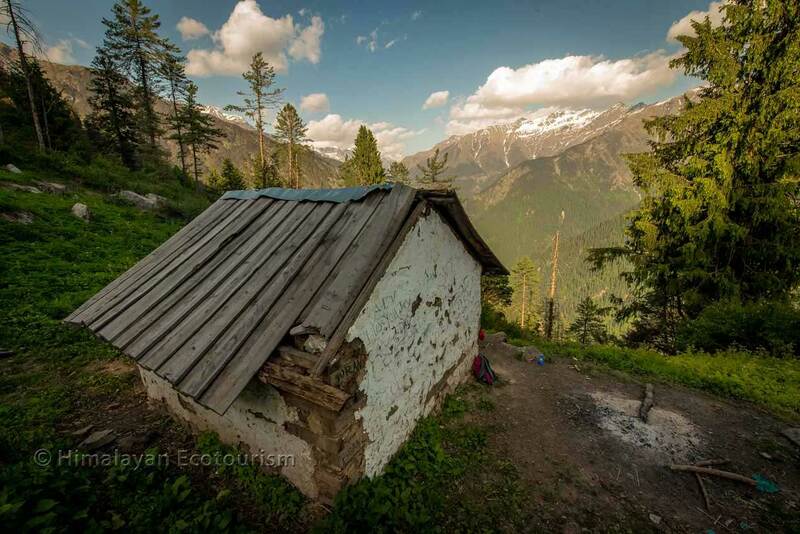 Shilt hut trek is the easiest and shortest trek in the GHNP that offers you a real experience of the Park’s wilderness. On the first day of the trek you remain by the riverside upto the campsite of Rolla. On the second day, after Rolla, you have a steep climb to the Shilt hut. During the climb you have great chances of observing the colorful Monal as you are going through dense forests, home to many bird species. You can barely see the mountains around before reaching the hut; it is only from the meadow at Shilt that you can enjoy the view of the surrounding peaks. 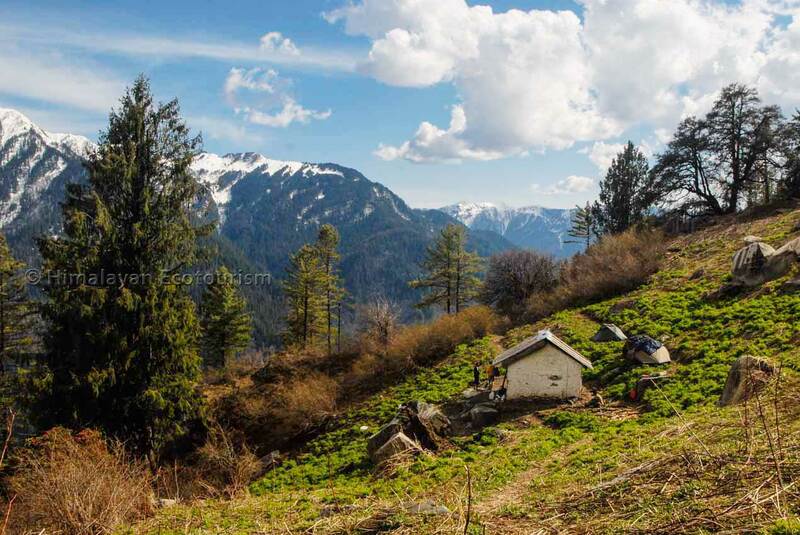 Though you can go to Shilt and come back in 3 days we recommend you to do it at least in 4 days so that you can reach Rakhundi top, a very scenic spot over the Tirthan valley. 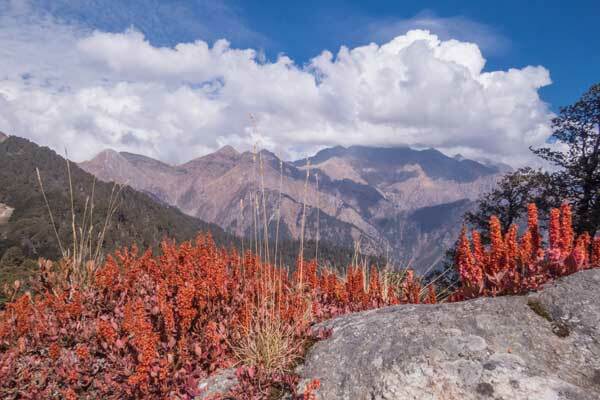 Moreover walking towards Rakhundi will allow you to spot local mammals like the Goral, the Himalayan Tahr, the Blue Sheep or even the Black & Brown Bears. So if you are nature enthousiast and you have enough time, keep 5 days for the trek ! 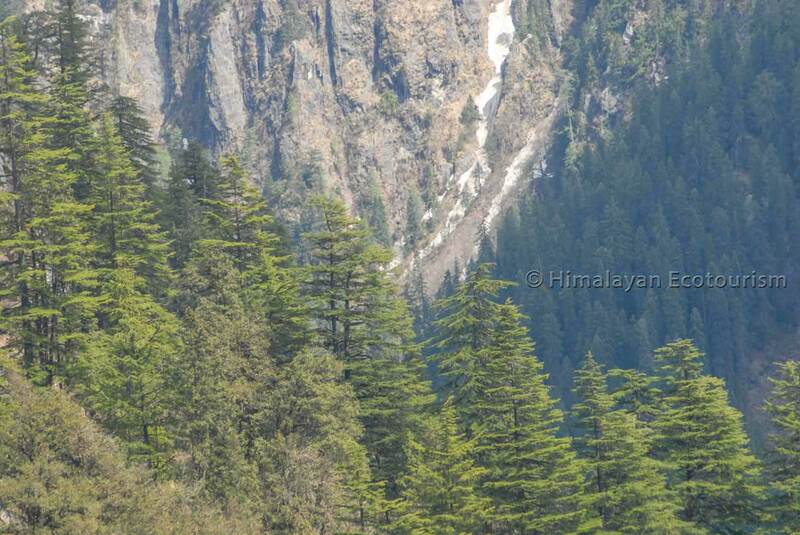 The trek starts with an easy and pleasant walk along with the Tirthan river up to Rolla. Then there is a steep but somehow short climb (3 hrs) to Shilt. From Shilt the way to Rakhundi is first easy and then very steep. Be careful in case there is still snow on the trail (early season). The climb to Shilt is moderate (1420 m in 2 days). 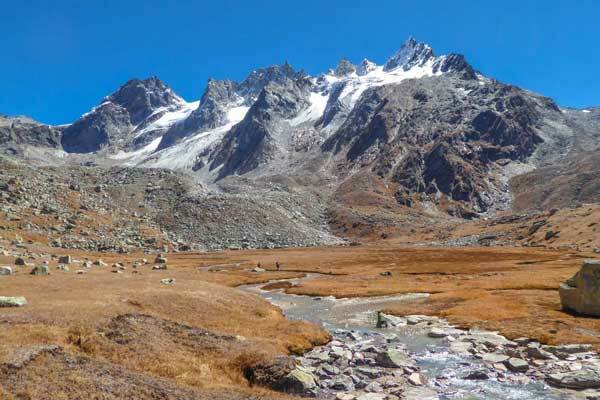 You need to be in good shape to reach Rakhundi since after Shilt the path goes down before climbing back up to 3600 m. Hence the total climb to reach Rakhundi is actually about 2500 m.
Best time to trek to Shilt and Rakhundi is April, May, June, and then October and November. You may also consider July and September. In case you go only to Shilt, March and December might also be possible. As your trek is in progress the human population starts decreasing and nature turns into natural wilderness. After walking for 3 hours along the Tirthan River you will reach the park entrance gate. Before you enter the park gate you may have your lunch. As you cross the park gate you are in the realm of Nature. On your way to Rolla, you will only come across one wood house where lives the last inhabitant of the Park, an old but very charming lady. The path will get narrower and forest will become denser. After hiking for about 45 minutes from the park gate you will reach Rolla Huts and campsite. Enjoy the company of our staff who prepares you amazing food and spend your first night under tents. 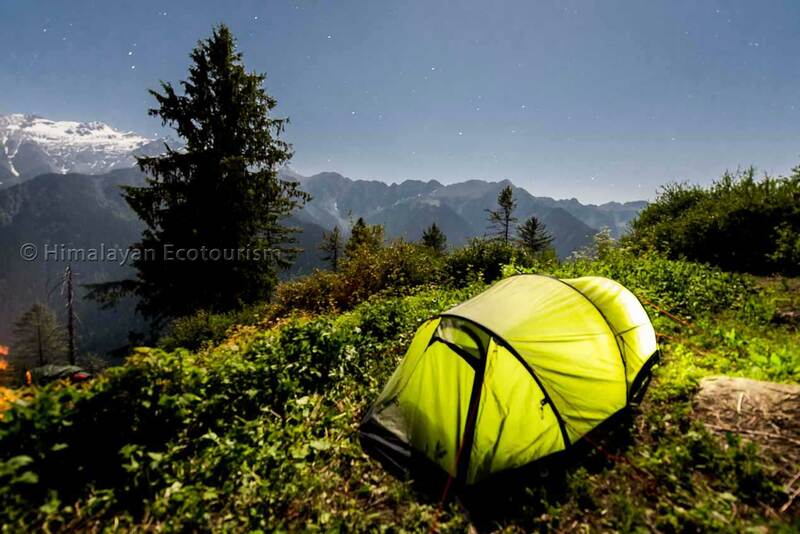 We are sure you've spent a comfortable night thanks to the care of our trekking staff (all members of our cooperative) and the quality of our camping equipment. From Rolla after a delicious breakfast you continue the path going along with the Tirthan river. Soon you will follow a narrow trail which climbs steeply across the forest. Try to be as silent as you can since the forest is home to many rare species of birds, especially the colourful Monal pheasant. Get ready with your camera. It happens quite often that troubled because of your presence the Monal start flying to a lower altitude. The mountain slope being very steep if you are lucky you may be able to take a snapshot from above and catch the awesome colors of the Monal’s plumage. Have your lunch on the way. You can reach Shilt hut in 3 hours of walk, so take your time. Before Shilt the forest give way to a large meadow. Without the trees the view gets clear and let you discover the Tirthan valley and some very beautiful peaks of more than 5000 m height. After setting up the camp at Shilt, enjoy the campfire and your meal under the stars! 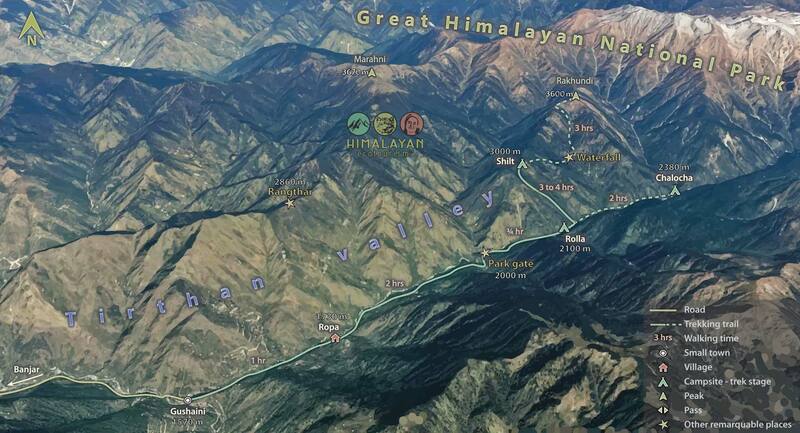 In case your adventure is a 3 day trek you will be going down back to Rolla and then all the way to Gushaini. Because the way back is only descent you can do in one day all the way you climbed in 2 days. End of your trek late afternoon. Don’t miss the beautiful sunrise over the GHNP peaks because of sleep! You won’t forget the view. Observe the birds early morning. The changing colors of the sky are another treat you shouldn’t miss. On the way to Rakhundi you cross path with a small colourful waterfall and then a typical high altitude bamboo forest. If you don’t have a walking pole offered by us while trekking under our "Everest plan” you can take a dry bamboo stick to help you on the way to Rakhundi . After the bamboo forest the path goes steeply towards a ridge that leads to Rakhundi. From Rakhundi top you have a 360° view over the Tirthan valley. A stone lies at the top. You will recognize it because of some colourful fabrics that ornate it. The stone shelters the local deity. Take sometime to respectfully greet the deity with your guide. Then feel free to enjoy the stunning feeling of being at the top of a mountain that is a unique panoramic viewpoint. Go down to Shilt via the same way and spend a second night at Shilt. After your breakfast the camp is packed and you go down to Rolla where you have your lunch by the riverside. You can add a day to your trek to Rakhundi top for observation of wildlife ! Day 3 Return hike to Rakhundi top from the base camp at Shilt. Day 4 Day free for photography, spotting wildlife, or just resting under a tree. Day 5 From Shilt hut to Gushaini. If you have 3 days only you can reach Shilt hut but not Rakhundi. Day 3 From Shilt hut to Gushaini. 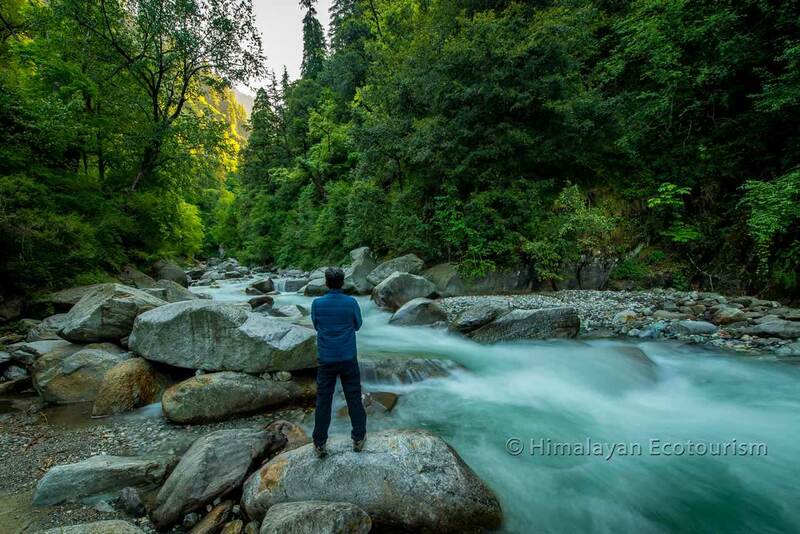 Contemplating the Tirthan river at Rolla is very soothing for your mind. The old hut was used by shepherds before the creation of the Park in 2000. An Himalayan Ecotourism tent at Shilt just after sunset. Enjoy camping without an hassle ! 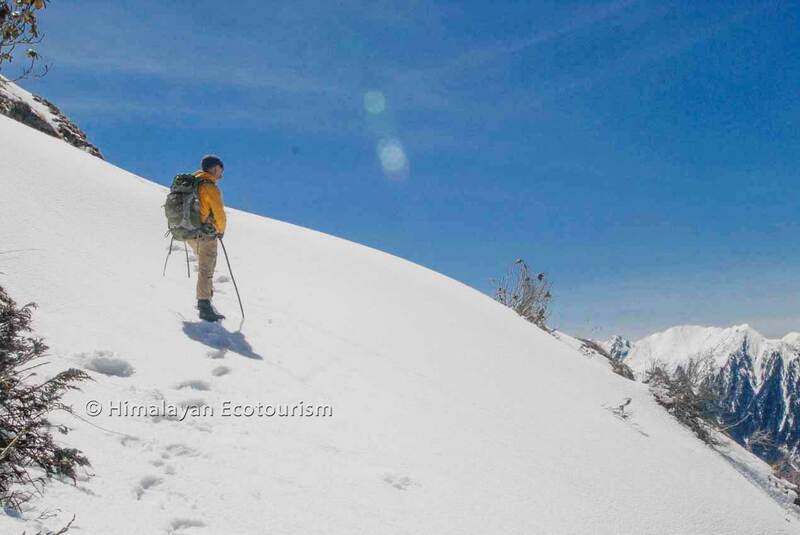 The last stretch to Rakhundi is very steep but offers unique opportunity to observe wildlife. Be alert ! Early in the season (April) Rakhundi top might still be covered by snow. Ask us advice before booking. 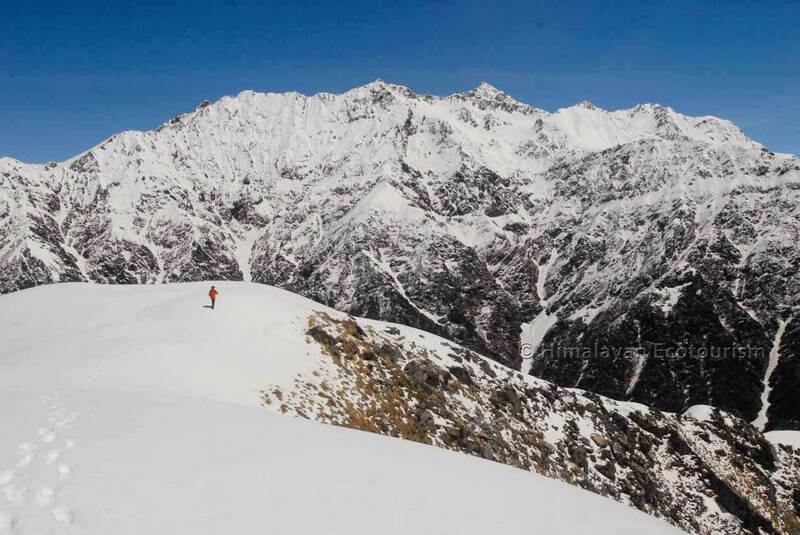 Reaching Rakhundi top on snow is an experience of a lifetime ! Whatever the season on this trek, the nature will always have something to offer for your eyes. 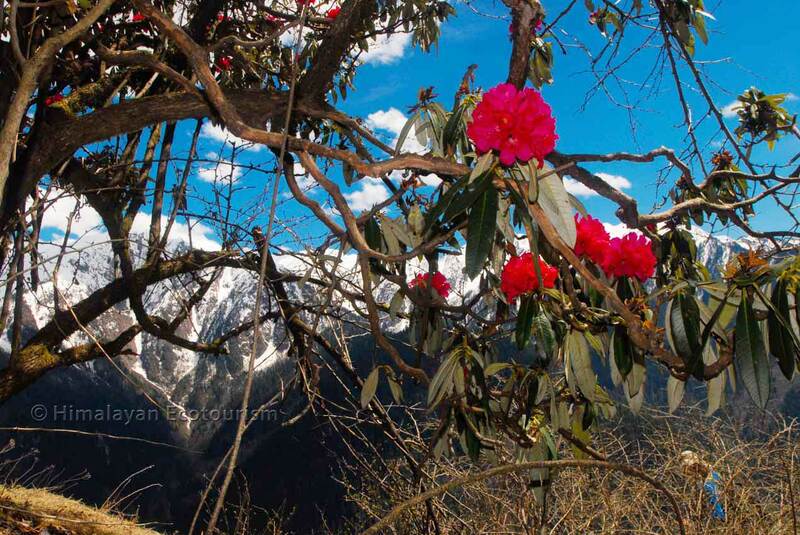 Take your time to enjoy the very special atmosphere of the protected Tirthan valley. The Shilt hut will definitely leave you with a sweet memory. 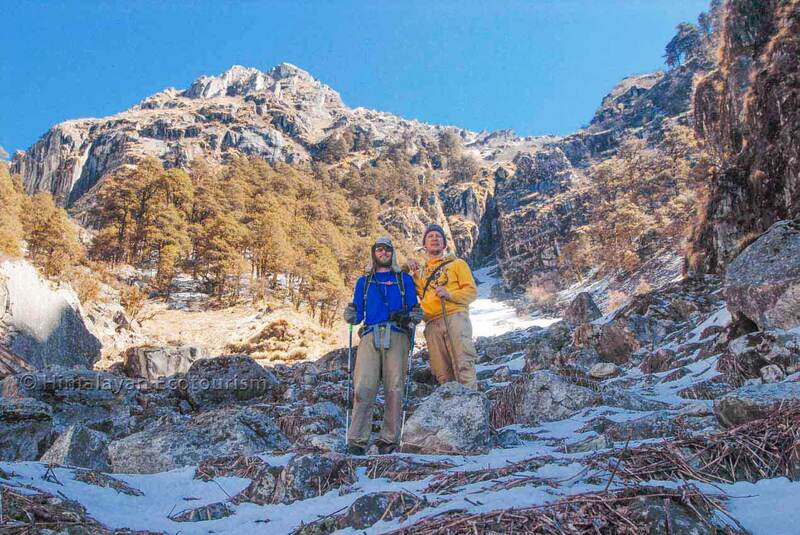 A choice of outstanding treks for entering the intimacy of the magical Tirthan valley.